When the evenings start drawing in, come and hear about Windsor's ghoulies, ghosties and ghastly happenings on a guided tour of the macabre side of Windsor. At your hotel if staying in the town or in the town centre by the Queen Victoria statue. Town centre or at a restaurant of your choice if eating in the town. In a town that is nearly one thousand years old, there are plenty of ghosts lurking around shops, restaurants and the Great Park, with even a few royal ghosts. Henry VIII, his daughter Elizabeth I, Charles II and George III all haunt the castle. Stories of Henry VIII exploding during his funeral and Charles I having his head sewn back on, go down particularly well! We reveal the macabre history of the town, such as the site of the gallows and burnings at the stake. Spooky stories include the tourist who fell through time, the royal physician and his ghostly carriage and horses, Cardinal Wolsey haunting a favourite tourist shop and a ghost in the local off-licence - in the spirits section! Stories of people's encounters with the ghostly world are actively encouraged! 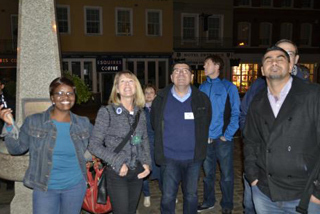 The Ghost Walk can be booked as a private walk for conference delegates, for clubs and associations, or a private group.